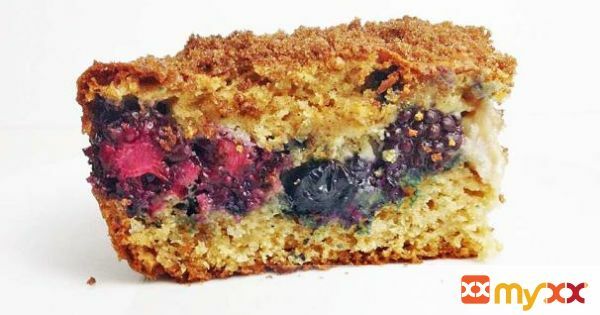 Moist cake with a tart layer of bursting berries mixed with cream cheese and a topped with a brown sugar cinnamon mixture. Perfect for any breakfast or brunch. 1. Grease a 8 by 8 glass baking dish. 2. Preheat oven to 350 degrees Fahrenheit. 3. Make the batter. Add flour, brown sugar, baking soda and baking powder to a large bowl. Whisk to combine. 4. Add wet ingredients together. 5. Mix eggs, milk, greek yogurt and vanilla extract together until evenly distributed. 7. Add the wet ingredients to the dry. Mix together until fully incorporated. 8. Add slightly less than ½ the batter to evenly cover the bottom of the pan. 9. Top with berries and sprinkle over batter. 10. Sprinkle corn starch over the berries. 11. Mix the cream cheese with granulated sugar. 12. Add dollops of cream cheese all over the berries. 13. Using the rest of the batter, spread evenly over the top of the berries. 15. In a small bowl, combine brown sugar and cinnamon for the topping. 16. Sprinkle over top of cake. 17. Cook in oven to 45 minutes, rotating ½ way through. 18. Let cool and enjoy!